Do you run a B2B company or work for one? If so, you know marketing for a B2B is quite a bit different from marketing for a B2C company. A B2B customer is unlikely to make a spontaneous purchase because he or she is walking by the business. In B2B scenarios, leads need to be nurtured. However, quality leads can also be hard to come by. It can also be more difficult to run the kinds of online campaigns that attract lots of attention and collect leads from hundreds or thousands of prospects. After all, a contest with a cruise or a $1,000 gift card as the prize might attract a lot of entries, but people who enter might only be interested in the prize and not in the insurance or tech-support services you sell. Below you’ll find four lead-generation ideas that will help you build email marketing lists full of leads that are worth your time. I’ve also got a few ideas for ways you can get the word out about those campaigns and, at the same time, promote your business. One way to collect leads is to share with potential clients some of the knowledge you’ve collected over the years. 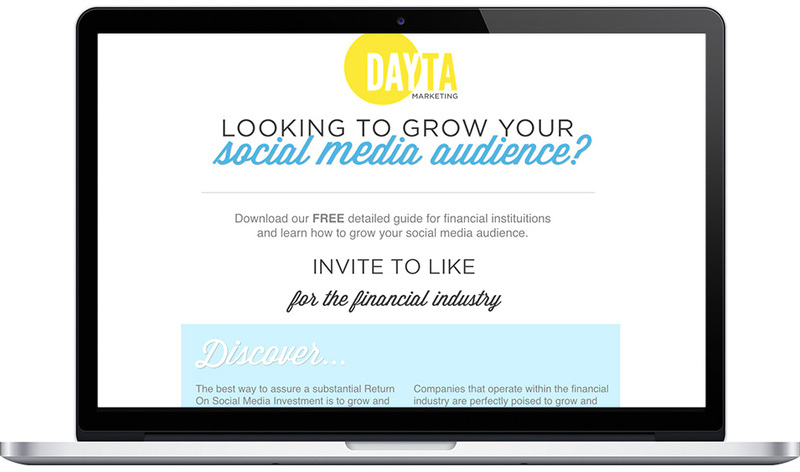 Dayton Marketing created a guide with tips for how financial institutions can grow social media audiences. In exchange for the guide, all Dayton Marketing asks for is an email address and a name. After someone fills out the form, they receive a downloadable version of the guide via email. A smart move, as sending the download via email ensures that folks who want the guide submit their real email address. Get the word out: White papers are designed to showcase your business’s expertise. They should provide readers with background on a topic, address a specific issue or problem, and relay your company’s point of view, or share a solution for a problem. As with most types of content marketing, people who find your white paper helpful will want to share it. Make it easy for them! Remember, you’re trying to gather new leads. This means you need to ensure folks share the campaign with your sign-up form included. Why? When someone shares the resource without your form attached, you lose out on the opportunity to move their “friends” through your sales funnel. Make sharing available on your campaign, so people can share right away. Then, use a follow-up email to send folks a link to the campaign a few days after they download the white paper. Encourage recipients to share the link if they enjoyed the white paper. If possible, include some positive reviews you have received about the white paper (#humblebrag) to influence the reader’s opinion of the piece. This also serves as a reminder to the people who downloaded your white paper, but haven’t read it yet, to take a few minutes to go through it. Do you have valuable information that will help your customers grow their businesses? Share it! SiteMinder is a leading expert in the hotel and travel industries — they specialize in helping hotels attract and convert guests. 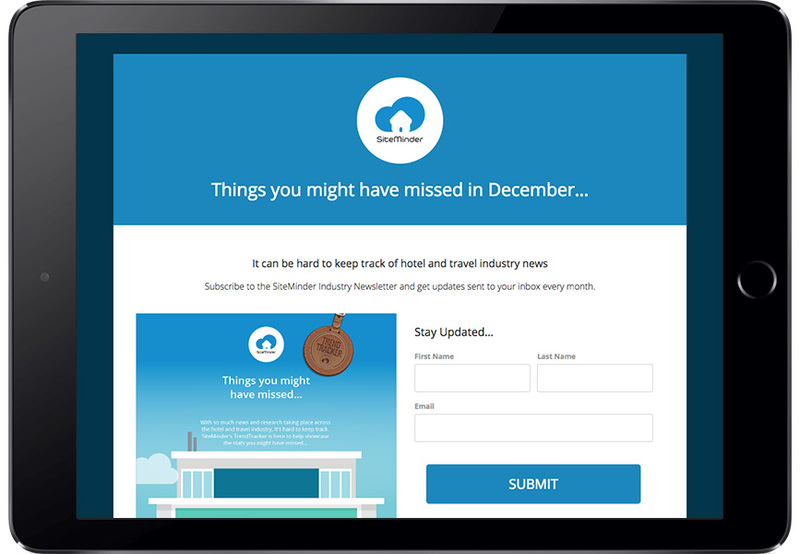 Each month, TrendTracker’s newsletter goes out to everyone on SiteMinder’s email marketing list. They created a landing page where people can subscribe to their newsletter and they included the information from their previous email, allowing folks to see what they’re subscribing to. Get the word out: Referral programs allow folks to get something in return for sharing your content, product or service. But referrers aren’t the only people who benefit from referral programs. They can be GREAT for your B2B. Referrers provide wonderful word-of-mouth marketing for your business. They tend to be strong brand advocates who provide positive reviews and good feedback of your product or service. How might you create a referral program in conjunction with your newsletter sign-up form? After someone signs up for your newsletter, send them an email with a referral offer. For example, offer a free t-shirt after the referrer sends over three new newsletter sign-ups, or provide them with $10 off your service for every referral. Within the email, include the referral URL for that individual. In order to receive referral “points” toward the reward you are offering, folks need to share the URL, then the people who click the URL must submit their information via the same form the referrer signed up with. Don’t forget to send follow-up emails with the referrer’s referral URL every couple of months and include the referral URL in the bottom of each newsletter. Want to learn more about your customers? A simple survey can do the trick. 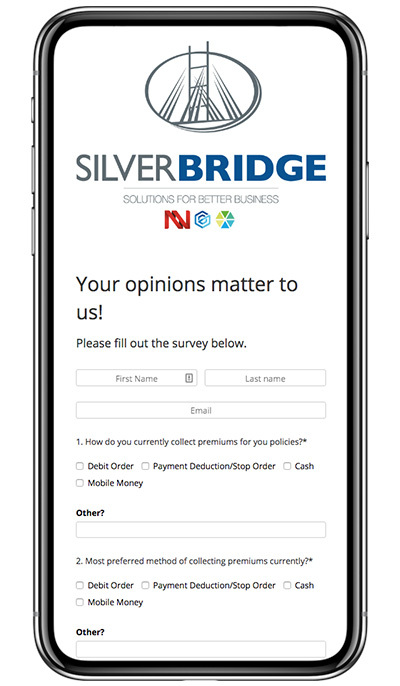 Check out SilverBridge’s customer survey for a perfect example. They keep the survey short, just seven questions (ok, it’s really nine if you include name and email address!). Keeping a survey short and only asking the questions you REALLY want answers to helps increase the completion rate, since people are more likely to fill out a short survey just to help you out. Otherwise, if you want to send a longer survey, you might need to compensate them a bit — try offering a free t-shirt or a gift card in exchange for their information. Get the word out: You might be wondering, how exactly can I get the word out about my survey? Well, in most cases, your survey will be targeted toward people who are already in your sales funnel. However, you may be able to leverage the survey results to draw in new leads. If your survey includes information that would be interesting to potential customers, try visualizing the results by creating an infographic. After you have compiled the results and created your infographic, send a follow-up email to the people who participated in the survey. Include the infographic and a link to download it. In addition, provide a link for them to share the infographic. This link would lead folks to a sign-up form where they can fill out their information in order to receive an email with the infographic (much like what Dayton Marketing did in the first example). Looking to add a bit of customer engagement to the lead collection process? A personality quiz can help you do just that. 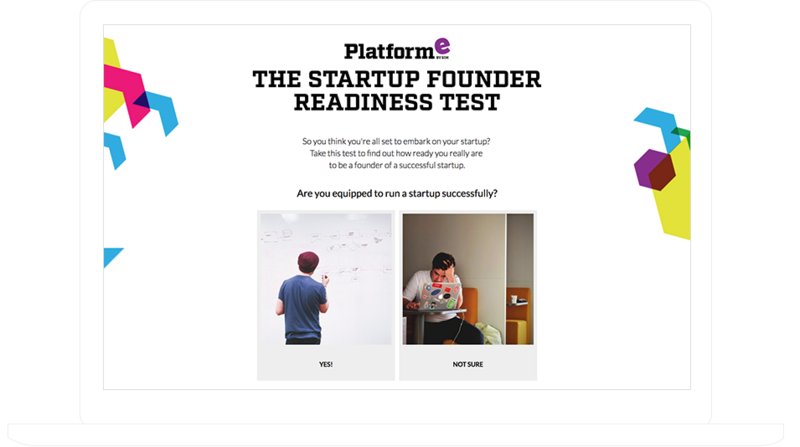 Check out the Startup Founder Readiness Test from Platform E. Platform E is an entrepreneurship “ecosystem” where they help start-up businesses through incubation, mentorship, industry knowledge, etc. With this quiz, they ask folks about their business idea, where they are in the business-planning process, and more. Then Platform E generates an assessment of the founder’s readiness to get their business off the ground. In an addition to their readiness results, the quiz taker receives links to Platform E’s courses. How to generate leads? Before folks see their results, require them to fill out a form with the name and email address. If you use our template, this information, along with their answers to each of the questions in the personality quiz, will be collected. Get the word out: Buzz-feed style quizzes are popular, so give folks the chance to share their results! Our template includes a Share Widget with each of the outcomes. These Share Widgets include the details of the result the quiz-taker received, along with a link to the quiz for folks who want to take the quiz themselves. Many folks think ShortStack is used mostly by B2C companies, but don’t be fooled! Plenty of people on our platform create dazzling campaigns focused on B2B marketing. After all, ShortStack IS a B2B company, and we use our platform for everything from contests to surveys, from UGC collection to email marketing, and everything in between! If you have any questions for setting up a campaign for your B2B, just shoot us an email: theteam@shortstacklab.com. We want to hear from you! Have you created a successful online lead generation campaign for a B2B company? Do you have some tried and true tips for sending quality prospects to B2B lead collection tools? Tell us more by commenting below.